712 km of cycling - as part of a bicycle world trip - from the capital Vientiane at the Thai border via Vang Vieng northwards to Luang Prabang and to the Chinese border further north. 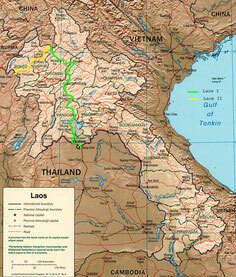 Do you like Cycling Laos I? Contrary to the announcements of all local Thai people that we should not cross the Thai-Lao-Friendship-Bridge by any means, no one stopped us and so we pedaled hard, crossed the Mekong and after the immigration and immigration formalities on both sides we went finally on, on the right side of the road again: I was in Laos! Full of anticipation for a smashing New Year's Eve party we drove the 25 km from the border to the capital Vientiane and after a day of sightseeing with the exploration of impressive temples, it was time: With Petra and Reimund from Dusseldorf, two Canadians and Steffi I went to the big Square in front of the Kulturpalast, where the New Year's Eve party with countdown and fireworks should start. All of a sudden you started on the stage counting from 10 backwards and we looked at each other in astonishment, because on all our watches it was only six minutes before midnight! No matter, we thought, counted with and at zero we went then, the fireworks: I had just pulled out my camera when the second rocket was shot down and we all looked expectantly into the sky. But that should have been it, because unfortunately, there was nothing more ... A dance to the live music and after half an hour, all the locals went home, which of course did not stop us from drinking one or the other BeerLao in 2006. At half past five I fell to bed, one and a half hours before the first corks pop in Germany's home. With a heavy skull, we cycled much slower than usual on the New Year heading north. What the Laotians had celebrated too little the night before, they caught up with all day long: Everywhere on the track was celebrated vigorously with loud music and crates of BeerLao. In Vang Vieng, a well-known backpacker resort in front of a fantastic mountain backdrop on the Nam Song River, we were greeted by menus with hash biscuits, opium teas, opium pies and other "Happy" deals. I did what almost everyone here does at least once: tubing on the Nam Song River! With a tuk-tuk we went several kilometers to the north, where we were each dropped off the river armed with a thick tractor's hose. Under blue skies and bright sunshine, we let ourselves drift past for some hours past steeply rising rock walls and countless beer stalls the mostly lethargic Nam Song. Simply totally relaxing! Over the next two days, Steffi and I fought each other from dawn to dusk through the mountains of Northern Laos, up and down through endless serpentines to Luang Prabang. Declared a World Heritage Site by Unesco, the city offered beautiful temples and traditional art along with many beautiful little streets, markets and, last but not least, a great view of the Temple Mount Phu Si on the Mekong and the entire city. We spent three relaxing days sightseeing, shopping at the markets and strolling through the small streets. With Petra and Reimund, with whom we had arranged to meet here, we experienced wonderful sunsets on the banks of the Mekong, where we made plans for some BeerLao. For the two of them should now go to Cambodia and Thailand to Australia and I wanted to go there eventually. In the next four days we went on through the mountains, past small, very poor and simple mountain villages with more restrained Laoten, north to China. In the morning we got a first taste of what we would expect even further north, because it was pretty cold! After 14 days and over 700 km through Laos we went on 11.01.2006 the last 20 km over a bad construction site piste to messengers at the Chinese border. Unfortunately, in these two weeks, we had to ask everyone before for the price, not to pay three times the actual price or even more. And too often one still tried to demand completely inflated prices. Of course we got to know many nice Laotians, but very seldom we were met so open and friendly, as in the other Southeast Asian countries. 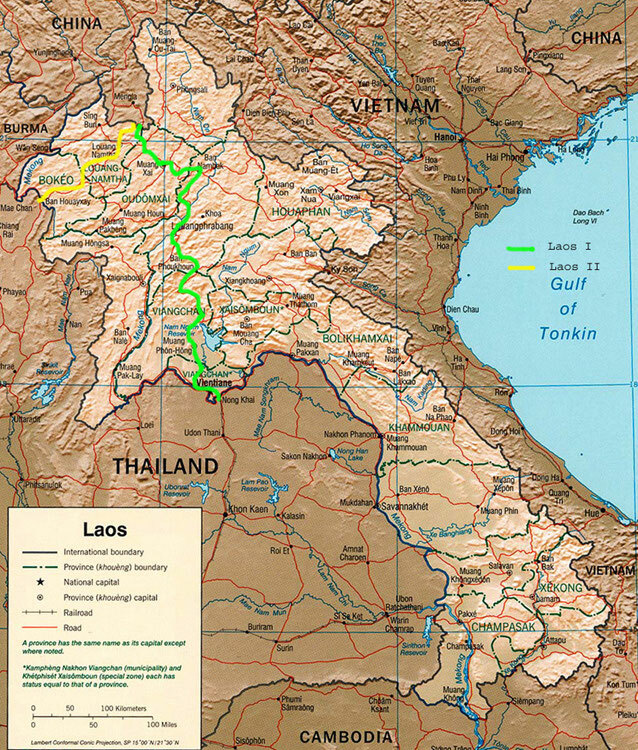 But a Laotian traveler, having traveled far and back home after a long absence, once said the following about his homeland on his return: "Laos is one of the last quiet countries of the world." Yes, he was certainly right!